hello, dear blog! I think about writing on here at least twice a week. And yet my last post was nearly a year and a half ago. So nothing profound today; I just wanted to record the completion of the biggest purge I’ve had to date. After we decided to (try to) move to MN, I began to look around me with fresh eyes: do I really want to pack that up and haul it to our new place? Usually, the answer was no. Having turned 30 has also made me approach our stuff with a more critical eye. In many ways I am the same person when I was 20 and in many ways I am not. How do my surroundings reflect the person I am now while honoring my past? I wanted to keep photos that meant something to me, and I didn’t want bulky albums to fill up our shelves (not to mention packing them up to move). 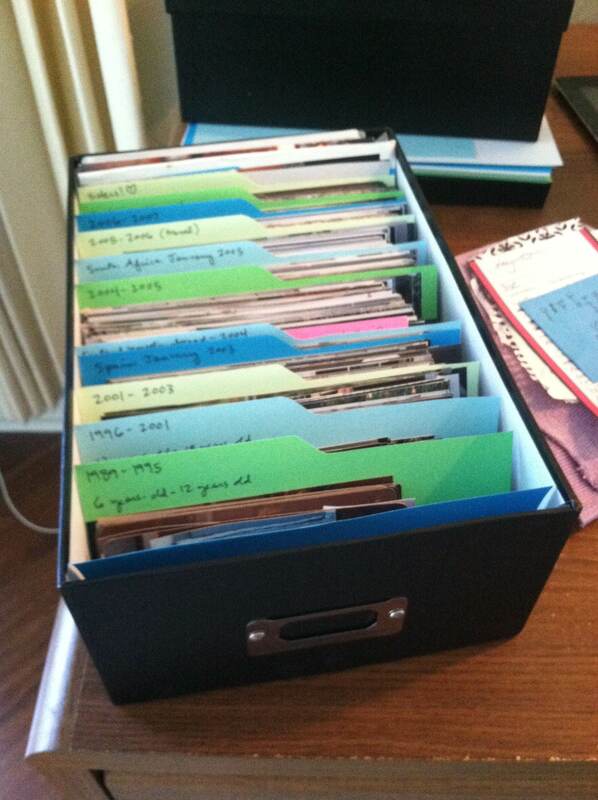 The solution, for me, was photo storage boxes. I never pulled down any of those big albums and paged through them anyway. 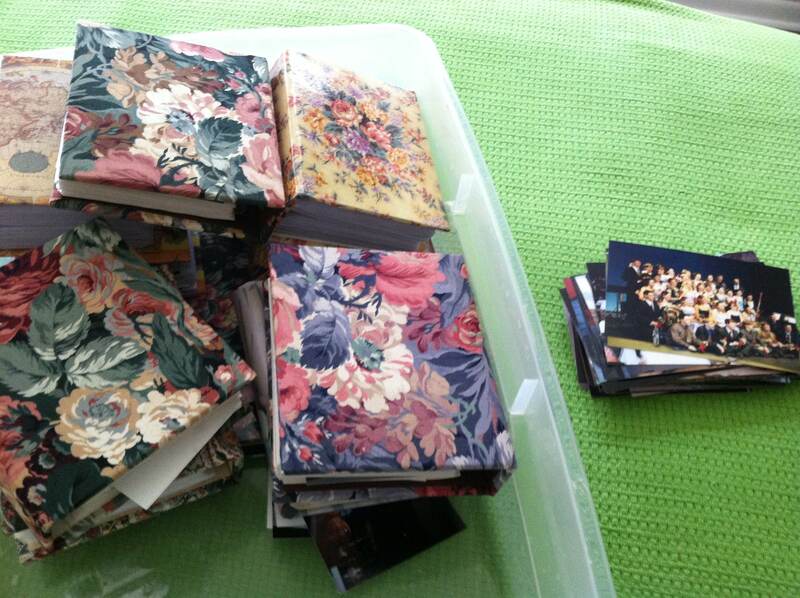 The old mini-albums were just sitting in our basement. Yes, when these pics are handled, they will get thumbprints on them. Yes, they aren’t protected in individual sleeves. But you know what, there’s something really intimate about being able to bring an older photo right in front of your face to peer at the details contained in that singular 4 x 6. I also culled our 4 CD cases—the kind that can hold both sleeves and discs and zips open like a shiny, colorful book. I kept some CDs out of sentimentality, and I tossed a lot of CDs that, when I really thought about, didn’t personally mean much to me. They reminded me of certain times of my life, but if I never ever listen to it again, what is the point of having that added weight? So from those 4 cases I consolidated down to 2. And it felt GREAT. I sold or gave away bulky baby items. We are still unsure about whether we want a third child, so we’ve been wavering about getting rid of the baby gear. We finally decided that whatever we end up needing, we can always buy/borrow again, especially with the ubiquity of craigslist, freecycle, and baby-rearing friends. I went through the boys’ toys, which I do a few times a year, but was more ruthless this time. We’ve hidden a lot of the toys anyway as to prevent a big mess to clean up for showings, and I’ve noticed how happy the boys are with minimal playthings. I went through keepsakes/mementos and, again, went with my gut. What was I hanging onto them for? How does keeping such dear objects stored in a musty basement giving them the respect they deserve? Reading Peter Walsh’s It’s All Too Much really helped me with this. With all of the updates Marshall has done to get our house ready to sell, it looks downright pretty now. When people are over, they ask, “Does it always look this neat and minimal?” No, of course not—we want to keep it in this condition for staging. However, I have definitely felt more peaceful ever since tossing and packing stuff away. I miss the family photos, Marshall’s whiskey wall, our colorful bookshelves, Everett’s drawings taped to the dining room wall—but all in all, there is something to be said for having everything around you have a purpose, and that you know what that purpose is. I am still dreading, however, the actual moving part…whenever it might happen. Onward and upward, I guess.